After learning How to Make the Perfect Cheese Fondue, I wanted to create something a little out of the ordinary– a fondue with a special “zing” to it. I decided to combine cheddar and pepper jack cheese, along with diced roasted jalapeños and a little smoked paprika. The result was seriously tasty, an easy dinner, and a super fun way to use up all the extra pretzel challah I made earlier in the week! The combination of salty pretzel bread and spicy cheese was super tasty. Regular challah or French bread would work great, too. If you’re keeping gluten free or on a low carb diet, you can dip fresh or lightly steamed vegetables– broccoli and cauliflower work well. I always get the question “can I make this without alcohol?” Well, good news! You can. It won’t taste exactly the same, but the non alcoholic version is pretty close to the original. Most fondue recipes contain wine because the acid content of the alcohol helps the cheese to melt smoothly. If you omit the wine, you’ll need to replace it with something acidic like lemon juice. To see the non alcoholic version of this recipe, click here. 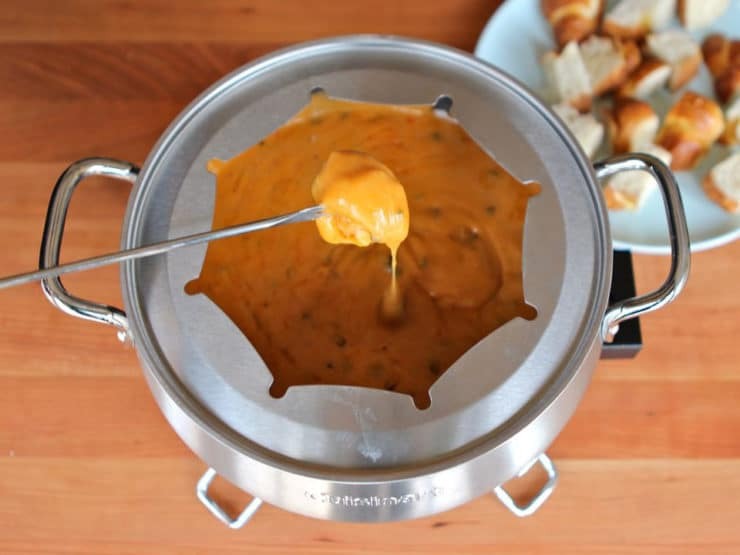 One word of caution– taste your pepper jack cheese before you make the fondue, especially if you’re sensitive to spice. Pepper jacks can vary in spice intensity. If your pepper jack is particularly spicy, taste it before adding the jalapeno, and only add as much jalapeno as you need to achieve the spiciness you desire. Enjoy! To learn how to roast jalapeños, click here. 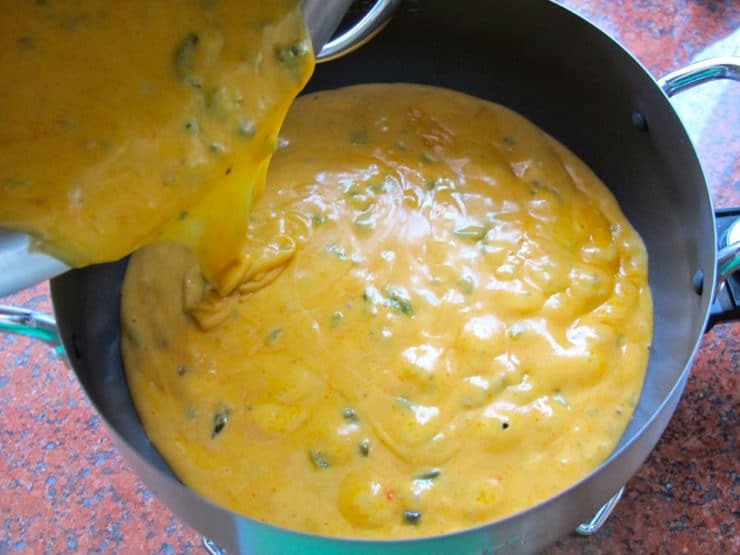 Learn how to make a perfect cheese fondue, then try my recipe for fondue with roasted jalapeños, cheddar, pepper jack and smoked paprika. Prepare the fondue pot by slicing a fresh garlic clove in half, then rubbing the sides and base of the pot with the cut side of the garlic. 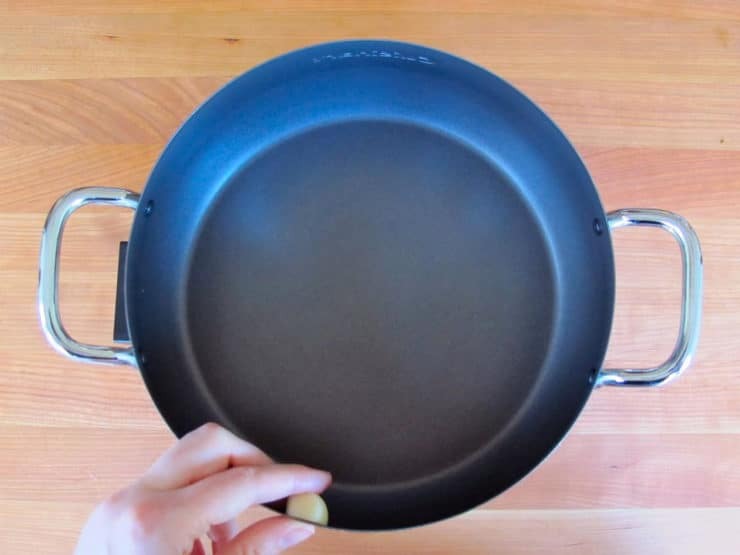 Pour wine and cornstarch into a saucepan on the stovetop. 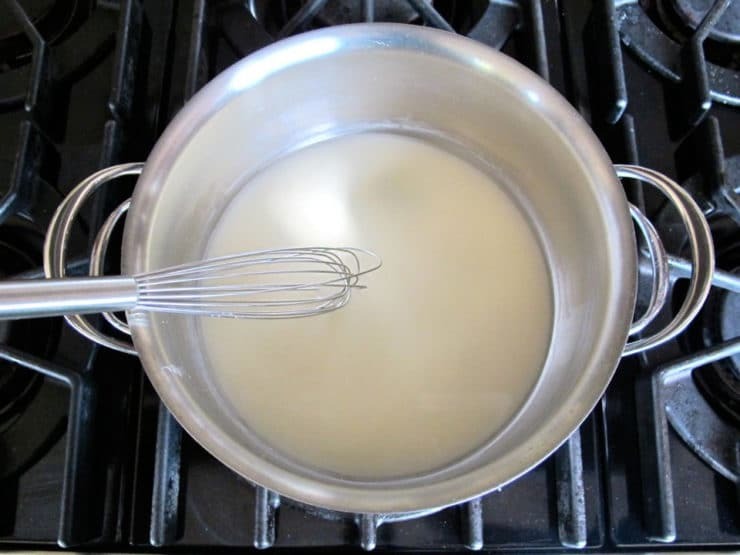 Whisk over medium low heat until the cornstarch fully dissolves into the liquid. Begin adding the shredded cheese to the pot gradually, one handful at a time. 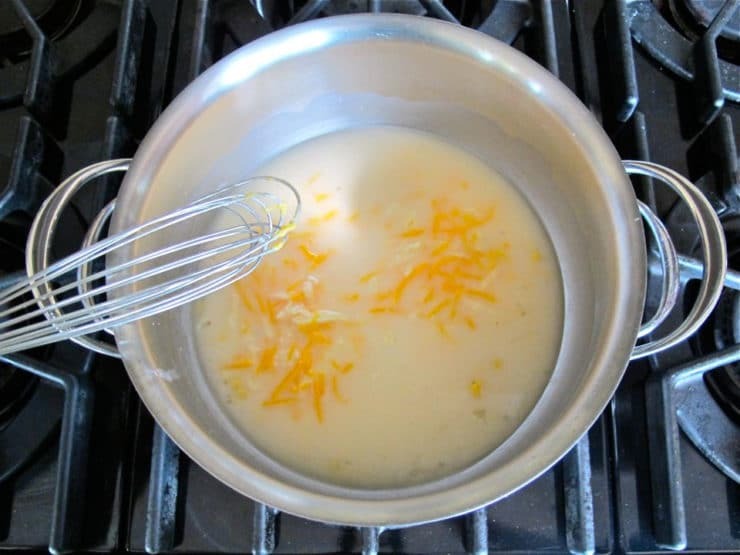 Whisk the cheese continuously as it melts. 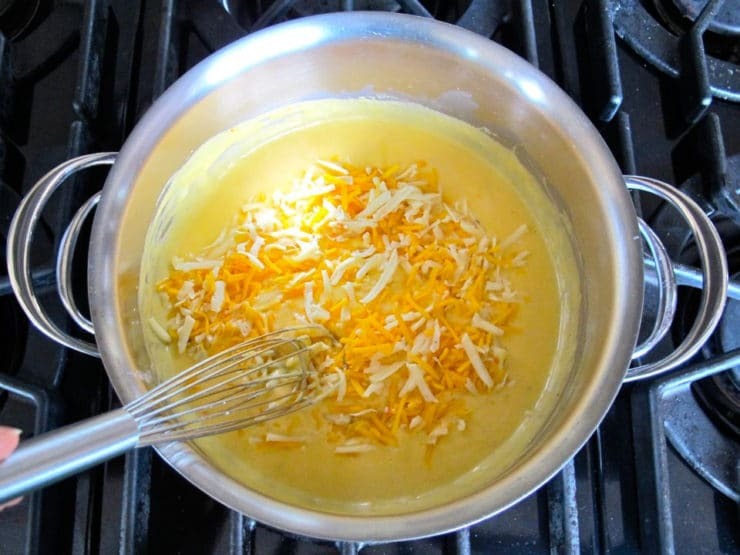 Let each handful of cheese melt before adding the next handful. Do not raise the heat or let the cheese come to a boil. When all of the cheese is melted, check the texture. If it seems too thick or lumpy, add a little more wine and whisk until the texture is smooth and right for dipping. 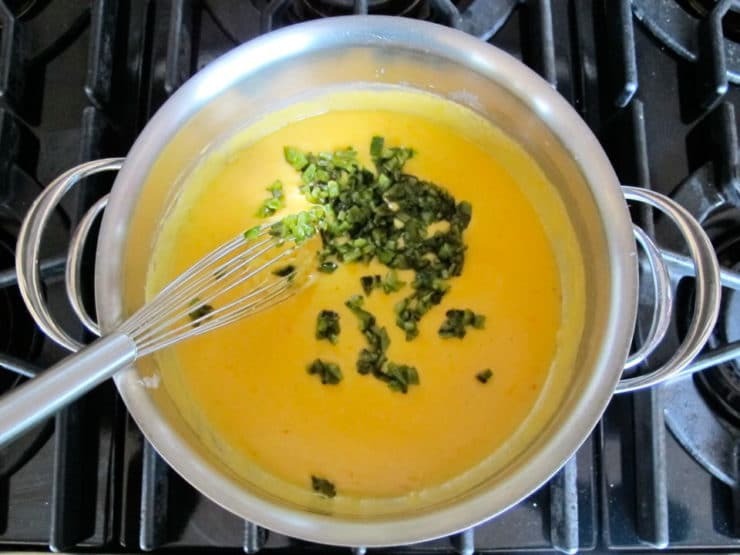 Add the minced roasted jalapenos to the pot and whisk to blend. Whisk in the smoked paprika until well blended. 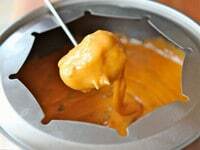 Transfer the melted cheese mixture to your fondue pot. Turn the pot on or light the heat source; keep the heat very low so the cheese stays soft, but doesn't boil. Serve cheese fondue with bread, lightly steamed vegetables, crackers, or my personal favorite--pretzel challah! This sounds so good! Do you have any sense for how many cups this makes? I am hosting an NYE party for about 30 and am wondering if I need to double this. We will have plenty of other appetizers, but also want there to be enough for folks to enjoy. Thanks! Hi Julie, not sure how many cups, but this recipe provides enough cheese for 4 entree servings. I would definitely double it and maybe even triple it for a party that big. Have fun! just wondering if you said “dont boil” for a reason? because i would love to cook steak in it….. but need to get it to a higher heat…..
Cook steak in the melted cheese? If I were you I would cook the steak beforehand… I’ve never heard of cooking it within the cheese. 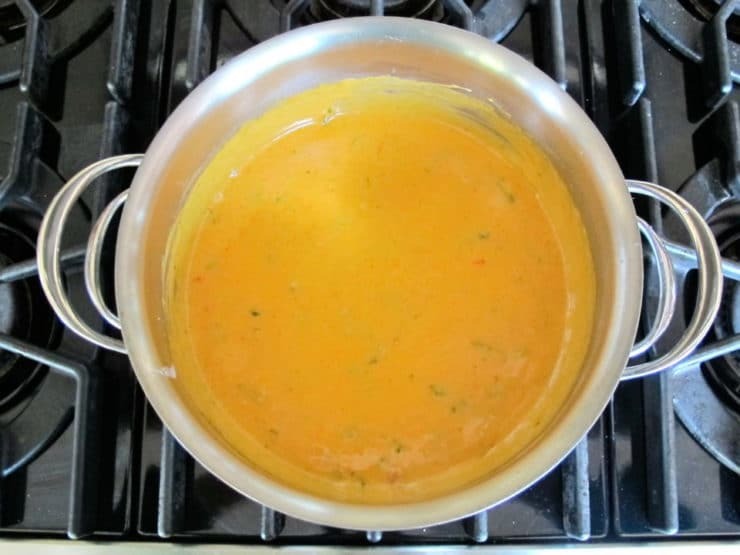 Boiling changes the structure of the cheese, you’ll have a better consistency for fondue if you do not boil it. I made this over the weekend and my 6 year old daughter loved it! Best fondue I’ve ever had! Wow! 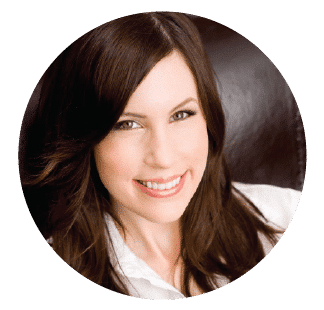 Just when I think there is nothing left on my plate to learn about running a Jewish home, chuckle along come Tori to give me higher standards to achieve! Thanks Tori Avey! Oh Tori you did it again! Yum a winner! Tori I like it spicy so Im going to add a tbsp Saracha hot sayce would kick it! 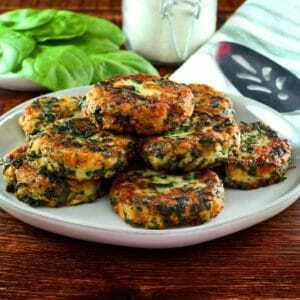 Also am a vegetarian organic and want to share tis delish Califlower recipe it califlower parmagarno! With no breading or frying its baked. If you want it msg me and ill send it too you! Its unbelievable! Gluten free too! We were delighted when we visited Switzerland and ordered it. We seldom and don’t like to drink wine or beer and found the Fondue had the bitterness in it. Otherwise it was yummy. Actually since the alcohol in the wine is cooked out leaving only a bit of flavor and no alcohol I would think it wouldn’t be a problem. Cannot wait to try nonalcoholic version with your pretzel Challah recipe, may try the roll version but could be time consuming to emerge unless maybe I use a wire spoon thingy! Yummy! I need to buy a fondue set! I made this a few months ago for a ladies night and it was delicious! I will be making it again as an appetizer for a holiday party. 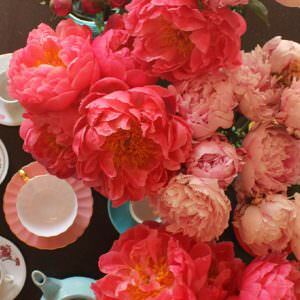 I want to make this for Valentine’s Day! Yum. I’ve always wanted to make fondue! Your tutorial makes it look so easy. And I am so spoiled because Whole Foods is 5min away and I’m there several times a weekl buying different cheeses..now here’s another excuse! I’m drooling now. i love the idea of adding to just regular fondue. Now let’s figure out one for chocolate! Sadly I am usually the one asking for no booze recipes. I have a serious aversion to it. 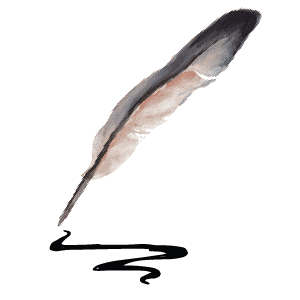 Conflicts with a health issue so I never use it or indulge. Makes cooking some things a challenge. Unless it’s something that burns off. This fondue looks so good. Good tip about tasting the cheese first. For the record, I am NOT the one that asked for a non-alcoholic version. Everything’s better with booze. This looks amazing. I love the addition of heat. This looks SO GOOD!!! I want to eat this right now!! Talk about mouthwatering! Nothing goes better with cheese than jalapeno heat! Thanks for sharing! So creamy! So cheesy! So delicuos!! I want to eat this by the spoonful!! Delicious! I’ve been slipping in roasted jalapeños everywhere I can lately. This combination looks divine — especially with the pretzel challah! It sure looks cheesy. 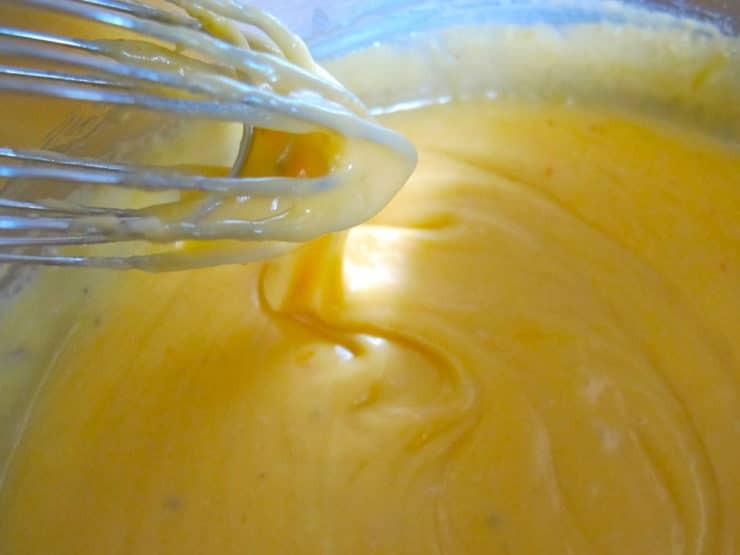 I’ve wanted to try making a cheese sauce for nachos, never thought to use a slurry. I think I might try it with a beer and then have a beer and nachos nachos.